Last fall I began learning how to spin. Inspired by our daughter, and enabled encouraged by some of my very talented fiber-y friends (Amy, Karen, Anne... you know who you are) I started playing with wool on an entirely different level. 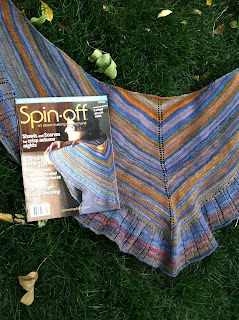 My newest pattern, A Gift From Laurel, was published in the Fall 2012 issue of Spin-Off. As if that wasn't enough of a self-pinching-surprise on its own, it also made the cover. It has been a delightful journey into the world of spinning. I hope it is just the beginning for me, I am already planning more and more... and more. The fun part! I have an extra copy of the Fall 2012 Spin-Off to give away. Even if you aren't a spinner (yet), there is a lot to love about the newest issue. This drawing is now closed. Congratulations to our winner~ Scarlet at Huckleberry Knits! Rules are simple and sweet, leave a comment to enter. Share on facebook, twitter, or your blog, and come back to leave more comments to enter multiple times. Comments will close on Tuesday, October 2, at noon. How sweet is that. I must make this considering I have a Laurel of my own. Congrats on the cover! What a lovely shawl, and a great story! Okay, I do NOT need the issue because I'm a subscriber, but--how did I not realize that was your shawl on the cover? How very cool is that?? Congratulations! Thank you, Deb! Maybe it was because I am "out of context" in Spin-Off, right? Hope you are enjoying the beginning of the fall season! Wow what a wonderful honor!! I would so love to win this magazine and check it out! I too am a new spinner! What a lovely shawl. I love that you used Enchanted Knoll Farm has lovely fiber to work with. I'm lucky enough to see Josette at area fiber events; she does beautiful work. Congratulations on having your pattern published in Spin Off and making the cover! I'd love to win a copy. 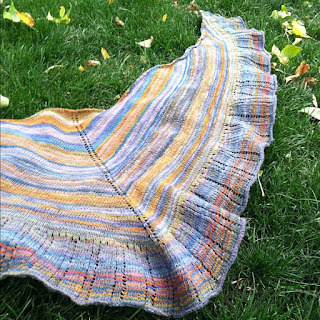 I love that shawl - simple but gorgeous and a terrific way to show off handspun. I have some lovely handspun that would look great . . .
Congrats to you! Your shawl is gorgeous!!! Joanna, I would love this magazine as just signed up for some spinning classes prompted by a demonstration at Knitwear on Sunday. Beautiful shawl! Got here from Julie's Facebook post, and I'll cross post. Hope you get more hits! Congratulations! I love Interweave magazines, but this is one I haven't subscribed to (yet). Thanks for the chance to win! 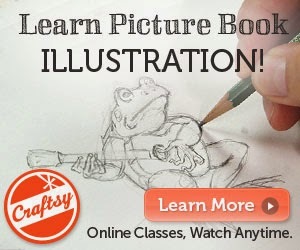 Wow, your work is absolutely beautiful! And well-deserving of the attention it is getting. Congratulations! It was so great to meet you at girl's night this weekend. Blessings! Why, thank you, Emily! I am so glad we got to meet and hang out last week- I am looking forward to more nights out with the girls! Congratulations on making the front cover. What a beautiful shawl. Wait a minute, I thought the spinning wheel was for Laurel.... :) So impressed with your spinning! Congratulations on making the cover--how exciting. I don't spin (yet!) but love reading Spin-off. Um... technically it *is* her wheel, but she is very sweet about sharing it with me. wink. Thanks for the kudos, it has been such an adventure already! Spinning wheels are for sharing. The fiber festival at Compass is Oct 6th this year and the kids are in charge of the fiber tent. I'm just a beginner myself. I would love to win the magazine. thanks! Congratulations on being on the cover of the magazine. I love the shawl pattern. I don't spin but I have a very good friend that does and would give her the magazine. Thanks for sharing your exciting moment with us! Love the shawl. What a lovely shawl, both the colors and the design! Congratulations on your swift journey from neophyte to cover girl. What a lovely shawl. Congrats on making the cover! Congratulations, Scarlet, you are the winner! Great job! I'm just trying spinning myself. Congatulations on something so wonderful and beautiful ! Oh, that is a beautiful shawl! Congratulation on making it onto the cover!